Ford Motor company is trying to be the first on the road with a solar-powered car for everyday use. The company is unveiling its concept model at the Consumer Electronics Show in Las Vegas this week. 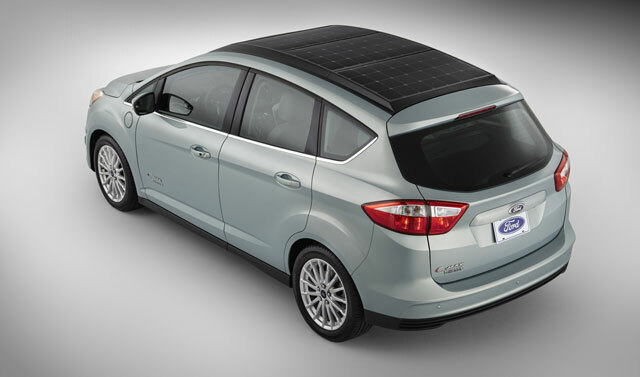 Ford has taken its C-MAX Energi plug-in hybrid, a gas and electric powered car, and lined its rooftop with solar panels provided by San Jose-based SunPower. The 300 watts of energy the rooftop solar panels generate are not nearly enough for a full day's charge, but the company has tried to solve that problem by building a solar-charging carport. "When you park that car under a concentrator, basically a magnifying glass," Ford’s Mike Tinskey says, "we can actually, in six hours, get a full 21 miles of range on that vehicle and that’s the part we are really excited about." It's not clear what you would do during those six hours that the car is charging. Most electric car drivers charge at home, at night, when electricity is cheapest. Ford's solar-charging carports would need to be in a very sunny place. But what's kind of cool about Ford's large magnifying glass thingy, is that the company is using a 19th century technology, a Fresnel lens, to harness the sun. "They were invented a long time ago for lighthouse use to take a single light and make it visible for a long distance. So we are using that same concept that was invented back in the 1800s to magnify the sun on top of our vehicle," says Tinskey. And if you are saying, "Hey, what about the fact that the sun moves during the day," well, good question and Ford has tried to address that. You can see their special solar-charging canopy and tracking system in this video. Just like other plug-in electric hybrids, after the battery runs out of fuel, in this case, solar energy, Ford's solar concept car can then switch over and run on gasoline. Ford says the car can get 100 miles per gallon in city and highway driving combined. That's more than enough to cut down on greenhouse gas emissions and be eligible for the HOV (carpool) lane. While this concept car may never make it to mass production -- the company would have to build an entire infrastructure of solar-charging carports -- some of the technology could end up in a solar-powered car in the future.